WINNIPEG, MB – Imperial Properties is pleased to announce that several of the communities in its management portfolio have received approval for the Power Smart Water & Energy Saver Program offered by Manitoba Hydro. The Power Smart Water & Energy Saver Program offers free Water and Energy Saver Kits to participating residents. Each kit is designed to increase the efficiency of water and electricity usage in households, thereby minimizing consumers' effects on the environment and reducing monthly utility bills. 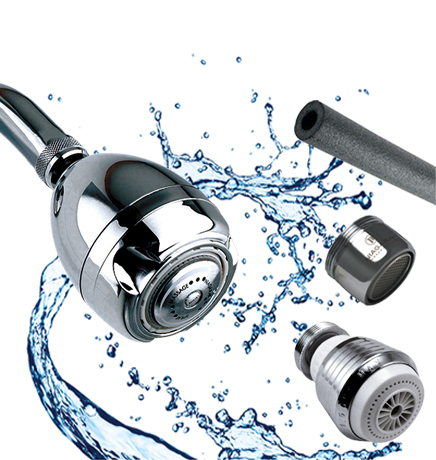 Kit contents include low-flow showerheads and faucet aerators, metres of insulation for water heater pipes and a refrigerator and freezer thermometer. Following installation, residents can anticipate decreases in energy and water utility bills. Manitoba Hydro estimates that homes participating in the program save approximately $30 per year on utilities costs. "Imperial Properties is excited to be approved for this important, energy-efficient program offered by Manitoba Hydro. The approval represents a value-added service and underscores our commitment to going above and beyond client expectations," said Norma Villamayor, Operations Manager at Imperial Properties. "Our property managers are always looking for innovative ways to enhance and improve our service offerings. Imperial Properties' involvement in this forward-thinking program will allow us to simultaneously support the environment and lower the overall cost of operation on our multi-family properties." Installation of the Power Smart Water & Energy Saver Program is already underway at numerous condominium and rental communities managed by Imperial Properties. Authorization to move forward with the program follows diligent efforts carried out by Imperial Properties' Tracy Sass ARM®, a property manager, and Jean Klatt, a property administrator in the company's Winnipeg office. In order to be accepted for the initiative, the management company had to work with Manitoba Hydro to ensure its properties met specific program requirements. "Imperial Properties looks forward to the positive and long-lasting effects that our participation in the Power Smart Water & Energy Saver Program will have on our residents and on our planet," said Villamayor. "We are proud to enhance the energy efficiency of our properties through this important service, and will continue on our mission to advance each of our properties in order to create the ultimate modern resident experience."